Christian Payne/Flickr. Some rights reserved. When the Snowden revelations were first published on 5 June 2013 only one Spanish paper, El Pais, made them front cover but only two days later and in the following terms” ‘US justifies mass surveillance on security grounds’. What made front cover, then, was the official US reaction and not the actual nature of the revelations. This parroting of the official discourse has been the norm in the media debate in Spain. 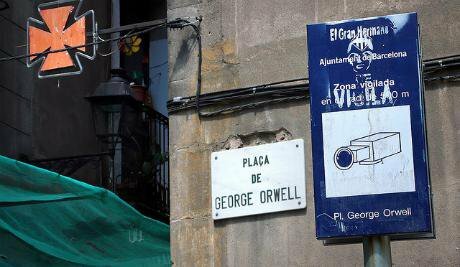 Along with the government dismissal of US surveillance as an issue, this has significantly shaped public debate in Spain on the effects of mass surveillance. In mid-June, the Spanish government simply issued a statement declaring that ‘if a citizen is aware that something strange is happening, they should address the national security forces so that an investigation is undertaken’. The Spanish Data Protection Agency, in turn, declared that EU authorities had already reacted by requesting more information from the US and that this matter had to be dealt with at the supranational level. In July, Edward Snowden approached the Spanish government with a request for asylum through the embassy in Moscow. He was told that he was required to be on Spanish soil to process the request (he was in Hong Kong at the time) and that his request had no legal effects due to the procedure used to present it. Shortly after, Evo Morales’ presidential plane was denied the right to fly over Spain on the suspicion that he may be travelling with Snowden. He was only allowed to refuel in the Canary Islands after Bolivia agreed for the plane to be searched, in clear violation of the country’s sovereignty. In spite of this, at the parliamentary level, the Snowden revelations have made their way to Congress, even if always at the request of the opposition and yielding poor results in terms of transparency and accountability. In July 2013, the United Left party filed a series of questions on the possibility for Snowden to acquire asylum status in Spain, on whether any steps had been taking to protect his life and freedom of expression. The government replied (a month later) stating what the procedure to request asylum was and its compliance with the existing legal framework. In November 2013 the director of the Spanish Intelligence Centre (CNI) appeared behind closed doors at the Official Secrets Commission. His appearance was agreed to after the media revealed that Spain was a ‘second degree’ ally to the US, and that the CNI had allowed or helped the US tap into 60 million phone calls between December 2012 and January 2013 alone. This was denied by the NSA director Keith Alexander, who emphasised that the metadata generated was gathered under NATO collaboration and was related to suspicious activity in third countries (Mali and Afghanistan for instance). The members of parliament who attended the Official Secrets Commission were specifically asked not to reveal the details of the session. Those who briefly spoke to the media expressed satisfaction and mentioned how the CNI director made it clear that Spain had always acted according to the law, that the data of Spanish citizens has not been compromised or made vulnerable by NSA activities and that it was US intelligence that should provide further explanations. In December, the left opposition requested permission for Snowden to travel to Spain and appear before the Justice Commission, but the request has seemingly been ignored by the government. 1) ‘What measures have been taken by the government to fulfil the fourteen recommendations of the LIBE committee report on the programs of massive surveillance of the US surveillance agency (NSA)? If the answer is affirmative, what are those measures? If the answer is negative, why? It is difficult to establish a direct link between the parliamentary and the media debate, but they both seem to share a lack of interest in the issue. If in parliament the left opposition is the exception to the rule, in the media, mass surveillance has only appeared consistently in the technology section of ElDiario.es. The impact of the Snowden revelations outside of the media and parliament are difficult to assess only twelve months after they occurred. Societal change cannot be measured in such a short time-span, especially when no specific efforts are made in this direction. The Data Protection Agency could have published a report or issued specific materials, but this has not been the case. Also, their 2013 report has not yet been published, and so it is impossible to look for relevant indicators there. The same can be said for the Centre for Sociological Investigations (CIS), responsible for Spain’s large opinion polls. The last relevant data we find in their survey series - addressing matters of trust, data protection and feelings of insecurity - is several years old. While this would pose methodological challenges, in the next few years it should be possible to use CIS data to identify trends and changes. Until then, we cannot make anything more than an educated guess. The privacy debate in Spain seems to be increasingly aware of the Snowden revelations and the data protection challenge. In the recent VI Surveillance and Society Conference held in Barcelona, specifically addressing the post-Snowden context, the media were reluctant to cover the event on the grounds of state surveillance alone and seemed to be more willing to link it to data privacy in social media and the responsibility of users. Similarly, the recently-opened Big Bang Data exhibition in Barcelona and Madrid relies heavily on the user experience and social media, making few references to Snowden, even though the curators have expressed how the revelations changed their conception of the whole project. Overall, the Snowden debate seems to be contributing to a more general debate on online privacy and the commercialization of data, while people’s expressed concerns continue to focus on unemployment, the crisis, and corruption. This is hardly surprising in a post-authoritarian country where top-down surveillance has been the norm rather than the exception for most of the last century, where most people confess to being distrustful of their neighbours, and where the financial crisis made all other issues fade into the background. There is no tradition of whistleblowing. But Spain is also a country that has seen remarkable instances of resistance to CCTV proliferation and where the outcry over Whatsapp’s data vulnerability did lead to many people looking – somewhat unsuccessfully - for instant messaging alternatives. There are signs that a debate has been sparked, at least in specific milieus and in relation to cybersecurity, social media and privacy concerns. And while the media and political passivity is an immediate challenge, general privacy concerns have managed to become the standard in technology reporting and policy. In this evolving context, every new revelation on the use and abuse of surveillance powers is contributing to strengthening the need for a true public debate on the possibilities and risks of the surveillance society.